Providing an inheritance for one’s children is a common desire among the current generation of middle aged Americans. Protecting that inheritance may be something that many of us overlook when planning for the future. After all, the assets to be handed down represent a lifetime of work and careful stewardship; generations of family owned land or a family run business hold financial value as well as emotional ties that run deep. Knowing that this inheritance, once handed down to the children, could potentially be at risk through liquidation from creditors or poor financial habits of the beneficiary motivates good planners to put safeguards in place, preventing future loss. By crafting an individualized Trust with sound advice from a qualified Estate Planning attorney, the inheritance that you leave can be protected from risk of loss. This can assure that your heirs still receive the financial benefits of the inheritance but do not have full access to the assets. Typically this involves appointing a Trustee to hold title to the property for the benefit of your heir. Example: A son inherits from his parents and the money is held in a Trust. His sister is the Trustee. The son wants to buy a lake cabin and asks his sister for the money. Instead of writing a check to her brother, the sister (Trustee) uses the Trust funds to purchase the condo in the name of the Trust. This way, the son uses and enjoys the benefits of the condo but does not own title to it. The Trust owns the title to the condo. It would therefore, not become subject to any creditors or predators that could threaten the asset. It does not become subject to claims of creditors and predators. What are the Risks? Who are the creditors and predators? *Divorce: While technically inherited property is considered separate from marital property, once the assets are inherited without restrictions, they often end up in a common marital pool of ownership. For example, depositing cash into a joint bank account will cause the funds to be commingled. It may also be seen as granting title to the joint account owner. In 2015 alone, Oklahoma had over 21,000 divorce filings. *Lawsuits and Judgements: In Oklahoma, more than 150,000 civil cases (individuals who were personally sued) were filed in 2015. A litigation target with protected assets is less attractive to an attorney because of the limited ability to collect from any civil law suit. A trust can render a judgment noncollectable. *Bankruptcies: Personal bankruptcies are far too common. Common causes are medical bills, uncontrolled spending, vehicle accidents and business failures. *Immature Financial Management Skills: Often a child with poor financial management skills who receives unearned income will be quick to part from the inheritance. Safeguards can be put into place to prevent a child from squandering an inheritance or making foolish investments with the money. *Mental Health/Substance Abuse: About 4.1% of adults suffer from mental illness. Those with mental illness may lack the necessary skills to make good financial decisions putting the inheritance at risk without the intended benefit. Additionally, drug and alcohol abuse is at an epidemic level in our society. A Trustee can help insure that the inheritance is used to pay for treatment or other beneficial interventions and not being used to further harm a child that suffers from addiction. *Special Needs: A child who has special needs such as mental or physical disabilities may become disqualified for government assistance like Medicaid or Veteran’s benefits should an inheritance be gained without the protection of a Trust. Careful drafting is required to insure that the trust property in not counted against the person with these challenges. *Blended Families/Remarriage: Many couples with blended families have similar goals. The first is to provide an inheritance for the surviving spouse. An additional goal is often that of insuring that the biological children as well as the step-children are assured the inheritance that is desired. 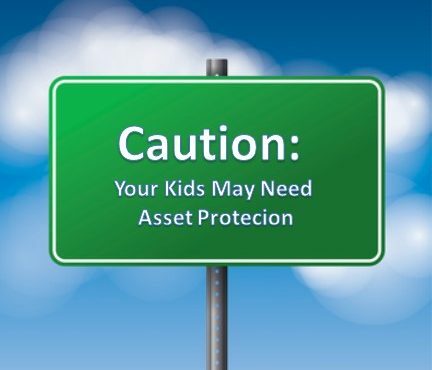 An asset protection plan can protect the surviving spouse and the children from the loss of assets or disrupted estate plans. *Remarriage: It is not uncommon for a widow to remarry. No estate planning can, or should, prevent this. However, the new spouse may cause assets ultimately intended for the children end up in their or their own kids’ hands. What can be done? Estate planning is more than generating documents. Involves counseling to meet the objectives of the client. Proper uses of trusts and other planning tools can insure that your intended beneficiaries receive and enjoy the full value of their inheritance.